For the second year in a row, I've had the honor of being a part of the Old Glory Relay. For those who don't know, it's a running event in which the flag is carried and passed across the country. The only difference this year is that the route went further south and bypassed southern Illinois. That's where my buddies Tom Harness and Brian Flath stepped in. 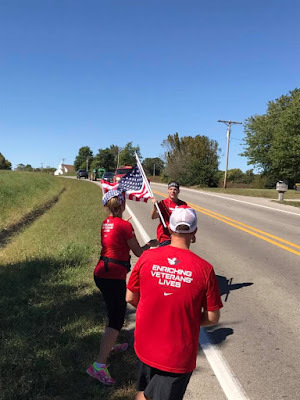 As members of Team RWB (the force behind the national effort), Tom and Brian worked with local veterans, runners, police departments and sponsors to make sure the Stars & Stripes made its way through our region too. The route of this year's Old Glory Relay went through three southern Illinois counties; Randolph, Jackson and Williamson. The course covered about 64 miles and was completed in about nine hours. I'm honored to have been a part of the effort, not just running with the flag, but also winding things down at the end. The final mile a large group of us walked the flag to the final destination. Lined the sides of the road and applaud as the flag passed. Others in the group, which included veterans, runners and children, carried flags too. The most poignant moment was watching veterans in the crowd get a chance to walk with the flag. Some took just a few steps, others went further along. There were tears and cheers and a lot of respect. It makes me proud to live in this great community of Carterville, Illinois but it also makes me proud to be an American. (Other communities were out supporting the relay too, I wasn't able to be at all the exchanges, so thanks to all who came out). I did not serve this great country in the military, but I will do all I can to support those who did. Thank you to all who served and to everyone who made the Old Glory Relay possible.